This European cycling holiday is designed to be a gentle and relaxing biking tour with a rest day roughly halfway through the week. You will be cycling from the Western Algarve area from Silves, mainly on quiet tarmac roads and occasionally dirt tracks. Quality bike hires with panniers to carry your luggage, and we include essential bike equipment in this special holiday package. Today is your arrival date at Faro Airport, with an included transfer to Silves, a historic town with panoramic views over the Algarve coast. Enjoy your first day strolling through the area. Today you will follow a great cycling track alongside the Rio Arade, which leads you away from Silves and up the hills to Estombar, before arriving in Ferragudo, a quaint little fishing village on the Ecovia do Litoral. There is a dedicated cycle route that runs along the Algarve coast, linking Cape St Vincent to Vila Real de Santo António. The Ecovia takes you over the new bridge into Portimão, and then along the waterfront down to the beautiful seaside resort of Praia da Rocha. You will be following the Ecovia for most of today’s cycling route, taking you through the popular coastal resort of Alvor and along the beach towards Lagos, a lively, historic town full of wonderful restaurants and entertaining street life. Today’s ride is mostly a flat route with plenty of opportunities to stop and soak up the fresh sea air. Be prepared, because the route today is quite a challenging days cycling incorporating a few hills and terrain changes as you approach the rugged cliff-lined coast around Sagres and Cape St Vincent. The route is along the Ecovia do Litoral and passes through some dramatic scenery and quaint coastal villages. Today is an opportunity to relax on pristine sandy beaches, or you can try your hand at surfing or windsurfing or explore the old fortress at Sagres. You may also want to head, by bike, to the southernmost tip of Portugal and Europe at Cape St Vincent. There is a good days riding planned for you today, heading North up the unspoilt western coastline of Portugal to your overnight stay in Aljezur, an ancient Moorish town situated in a lush green valley and built on either side of a river that runs through the valley. Another challenging ride is planned for our cycling route today, but it is well worth it. Monchique is a market town up in the Serra de Monchique, which is a thickly wooded mountain range separating the Algarve from the vineyards of the Alentejo. The journey up to Monchique offers spectacular views and is very different from coastal Algarve. It is a very quiet and relaxed place, which is ideal for pottering around and appreciating the fantastic views. Included transfer to Faro Airport for your flight home. Mostly flat with some short hill climbs on days 4 and 7. A long climb out of Aljezur on day 7 can be avoided with a transfer. Algarve cycling routes may be subject to change or alteration. All route notes, maps and day-by-day information will be given to you upon arrival at the first hotel or the welcome meeting. GPS/GPX files are available for most of the cycling holidays we offer. Please ask us for details. For other Algarve cycling routes check out our Eastern Algarve cycling holidays or even our seven-night cycling in the Algarve tour. In addition, we also offer a wide range of other cycling holidays in Portugal. 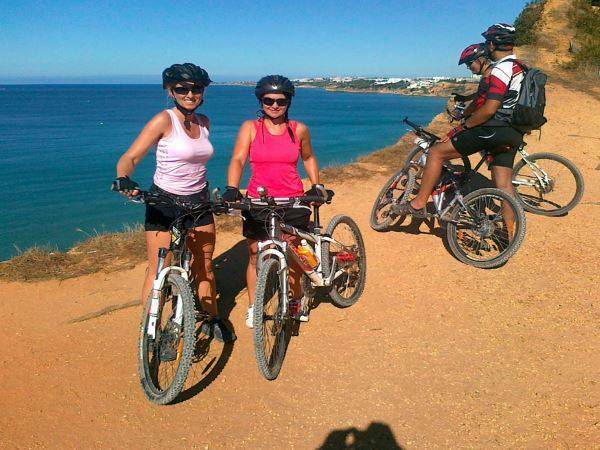 We recommend flying to Faro airport to reach the starting point of this cycling holiday to Praia da Rocha. You do not need to go back to the starting point of the cycling holiday to Praia da Rocha as all hire bikes are left at the final hotel. Important: Please book your flights only after the cycling in Lagos and Portugal holiday has been confirmed by invoice or email. Flights and transfers are not included in the advertised Western Algarve cycling holiday price. The Western Algarve cycling holiday includes the daily transfer of luggage to the next hotel and local support if required.